A 5K and a Fun Walk with family and friends to help Quota raise funds for services and hearing equipment for the deaf and hard of hearing! Click link below to sponsor, donate or walk. Join forces with Quota Club of Grand Rapids to support the needs of the deaf and hard of hearing in our community! 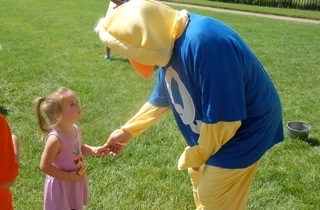 Quota is sponsoring the 9th Annual Quota Cares Duck Walk and More on Sunday, September 16 at the Mary Free Bed YMCA in Cascade. We are partnering with the MFB YMCA to fund all of the nine hearing loop systems installed in the classrooms there. Each looped classroom enables individuals with hearing aids to hear more clearly. With each system costing $3,000, won’t you help us complete this major project? The two hour event features 5K and 1K Duck Walks, free activities for the kids, refreshments, silent auction, the YMCA Veggie Wagon, YMCA tours, and educational materials. Your support will not only make the YMCA more hearing-healthy, it will assist Quota in providing many otherwise unmet needs. Click here to sponsor, donate or walk.